Fight to win! These athletes hope someday to join the national team. Around 600 competitors from more than 40 different teams of 6 to 18 year olds took part in the ‘We Love The King’ Taekwondo competition on July 29 and 30. 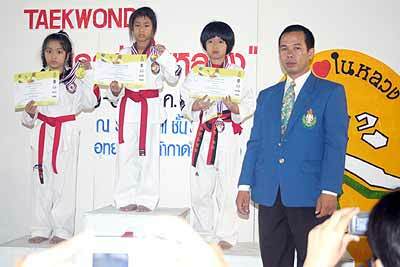 The Taekwondo Department of the Sports Association of Chiang Mai (SAC), in cooperation with the Physical Education Institute, arranged the competition, which took place at the Sky Hall on the 5th floor of Kad Suan Kaew department store. The event was held to honour the 60th anniversary of HM the King’s ascension to the throne. Funds raised at the competition will be used to promote taekwondo in Chiang Mai and to give financial support to less wealthy athletes wishing to compete in national level events. Young female taekwondo athletes show that they have learned and impressive fighting style. 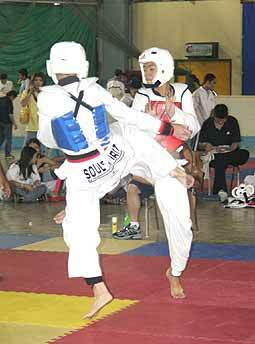 Although taekwondo originates in Korea, its popularity has soared in Thailand over recent years. Parents have encouraged their children to study taekwondo in order to benefit from the exercise and self-discipline the sport requires. Taekwondo develops body coordination, builds strength and stamina as well as encouraging confidence and self-esteem. It also gives young athletes an opportunity to learn about winning, losing and forgiving and provides them with an outlet for their energies away from drugs and crime. Young athletes receive their hard-fought medals. 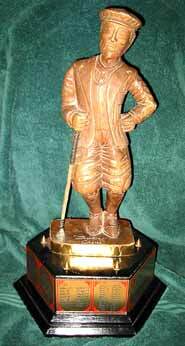 Fifteen years ago, the late Horst Fruechtenicht donated the “Little Man” trophy, which was fought for weekly at small golf society meetings in Chiang Mai. But since Christian Tilden initiated the Royal League three years ago, this prestigious little figure has been the first prize awarded in their monthly tournament. The event is played on the first Thursday of every month, and last week Ian Laidlow joined Steve Polaski in being the only competitors so far this season to win the title twice. This was a special achievement for Ian considering his handicap was cut by 6 strokes that morning in accordance with the newly adopted USGA system. On joining the League, Ian protested that a 27 handicap wasn’t high enough, but the hard work he put into his game has paid dividends, with numerous wins in competition and a consequent lower shot advantage. “I was a bit shocked in having to play off 20,” he said after last week’s medal, “but perhaps that went towards improving my game. Maybe I can get down to 18 or 14 in time.” And we wish him the best of luck. With soft holding greens at the Highlands Golf and Spa Resort, Ian shot a gross 86, net 66 in this stroke play tournament, to take home the Little Man. An hour before he walked from the 18th hole, Jon Haid had been leader in the 19th sweating on a net score of 70. This had been Jon’s best round for quite some time, and the result was certainly good enough to win in many circumstances, but this time he had to content himself with worthy runner up. Big hitting Steve Polaski came in third with a net 71 off an 8 handicap after producing a fine exhibition of long iron play and approach work, not forgetting that he ended up pin high from the tee on the par 4, 11th. Last week’s results firmed up Ian Laidlow’s place at the top of the Prize Winners List, while Steve Polaski closed the gap on Scot Stairs in second. 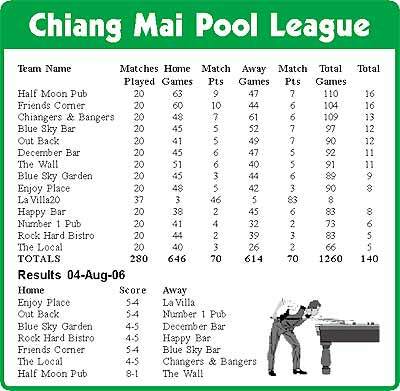 While the Chiang Mai Pool League seems to be turning into a two horse race, seven sides have a mathematical chance of landing the title. Five of those emerged victoriously from last week’s fixtures, with The Wall and Blue Sky Bar still in the top half but losing ground. Half Moon Pub and Friend’s Corner maintained a 3 point lead over their nearest rivals with convincing wins last time out. The Moon responded to going 0-1 down to The Wall by winning the next eight frames - end of story. Blue Sky Bar put up more of a fight at Friend’s Corner, but after chasing the game throughout the singles, they found themselves 2 frames adrift at the interval. Friend’s made short work of the match by taking the first doubles, but The Bar won the remaining two to chalk up a respectable 4-5 score line. All but three of last week’s matches went to the wire, and The Local will be kicking themselves for narrowly losing out to Chiangers and Bangers. 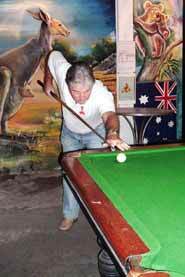 They lost a golden opportunity of rising from the bowels of the league in a deciding frame, when Andrew’s attempt on the black heartbreakingly rattled in the jaws of the middle pocket, and the rest is history. There was just as much excitement in the derby contest between Blue Sky Garden and December Bar. In a match of nip and tuck, scores were level at half time, and again at the start of the final frame, in which a Garden player, who preferred not to be named, gifted December by missing the simplest of chances on the deciding black. This result pushed December into sixth spot, one point behind Out Back, who came out on top in a closely fought home encounter with Number 1 Pub. The away side moved into an early lead, but Out Back pegged back to all square at the interval. Number 1 took the first doubles, Out Back replied, and for the second week running the home team’s new boy, Dave, bagged the last black. With little to choose between the sides, Enjoy Place and La Villa were never more than one game apart throughout their match, but Enjoy put away the concluding eight ball to take the honours 5-4. Meanwhile, it was a familiar story at Rock Hard Bistro, where the home side suffered their eighth 4-5 defeat in the last 12 matches. The Rock held up well with Happy Bar in the singles to go in even at the break, but their pairings let them down again, and they failed in the first two doubles. In the latest episode of the league in crisis, John has reiterated that he is definitely stepping down and won’t change his mind, and few people have come forward with suggestions for an alternative. Further to last week’s news, I am prepared to collect results, work out the league tables and deal with the newspapers. Craig at The Local has suggested that team captains from any independent match could act as a referee in the event of disputes. Someone is needed to take details from me on a weekly basis and photocopy them for distribution to league members. They would also need to work out the fixtures for the next season – the system would be supplied – and collect and utilise membership fees.